For Chick-fil-A Vine City, remarkable service stretches far beyond restaurant walls. Today, the Westside faces a different kind of challenge, with 60 percent of its children under 18 living in poverty. And, while so many have left it behind, divesting as their interest moved elsewhere, others are doubling down on its potential. In 2017, Chick-fil-A announced plans to open a new restaurant on Atlanta’s Westside, located in the storied neighborhood of Vine City. Though the Chick-fil-A Foundation and Chick-fil-A Chairman and CEO Dan Cathy were early investors in the area’s revitalization efforts, this restaurant would stand as a symbol of Chick-fil-A’s all-in commitment to bringing prosperity back to a hurting community in the city it calls home. “I want the children of this community to know the heritage of the neighborhood and have the pride of knowing that giants walked the same streets they play on,” said Quincy L.A. Springs IV, the local franchise Operator of Chick-fil-A Vine City. This month marks one year since Chick-fil-A Vine City opened its doors. Since then, Chick-fil-A Vine City has created more than 90 jobs for members of the community and provided support in the form of financial literacy courses, youth camps and food donations. It also jumpstarted new economic development in the area; at least four more businesses have opened within walking distance of the restaurant in the past year. 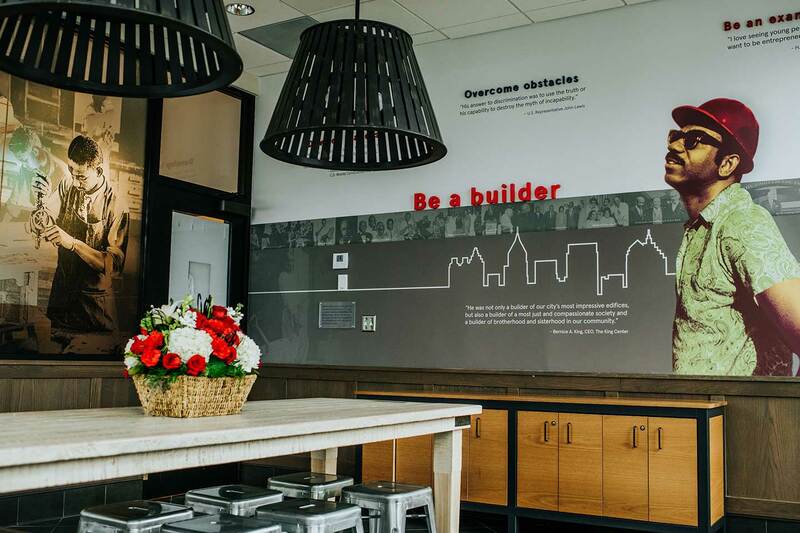 To celebrate the first of many years as a committed member of the Westside, Chick-fil-A Vine City hosted more than 100 Atlanta business and community leaders on February 19 as it unveiled and dedicated a new community room named after Herman J. Russell, Sr. The room features a mural honoring Russell, whose African American-owned construction company changed the Atlanta skyline, and Chick-fil-A Founder S. Truett Cathy, who spent his childhood on Atlanta’s Westside when he lived in the city’s first public housing development and sold Coca-Cola door-to-door. As both found success in their endeavors, neither would forget their humble beginnings, committing themselves and their businesses to bringing prosperity back to the place they once called home. The Vine City restaurant complements an array of other programs and activities in which the Chick-fil-A Foundation and Dan Cathy have participated over the past five years. Alongside the Westside Future Fund, Chick-fil-A has actively supported the community through efforts including employee volunteerism, youth sports camps, meal packing, donation drives, student mentorship, helping to fund a new school-centered health clinic, and hosting a campout for Atlanta CEOs to urge a collective commitment to restoring the Westside. To facilitate a more consistent dialogue, Chick-fil-A started the Transform Westside Summit (now run by Westside Future Fund), a bimonthly meeting where residents, leaders and executives in the community can engage in productive conversation about the progress and potential of the Westside. “We’re coming together as a community to take good care of our neighbors. This is the Atlanta way,” says Rodney Bullard, vice president of corporate social responsibility for Chick-fil-A, Inc. and executive director of the Chick-fil-A Foundation. In March, the Chick-fil-A Foundation and Mercedes-Benz Stadium will host the inaugural Beloved Benefit, a fundraiser to raise visibility for and celebrate the outstanding work underway to revitalize the historic neighborhood. The event, led by Ambassador Andrew Young, Bernice King, Arthur M. Blank and Dan Cathy, will bring all of Atlanta together — citizen and celebrities, leaders and residents, clergy and professionals — to unite around Atlanta’s Westside. Steve Harvey will serve as the evening’s host, and world-renowned musical guests like Bruno Mars and Emeli Sandé will perform. All funding raised during the benefit will be donated directly to charitable organizations. There is still much work to be done, but with continued commitment and investment, Atlanta’s Westside community can once again be brimming with the hope and possibility that put it on the map years ago.